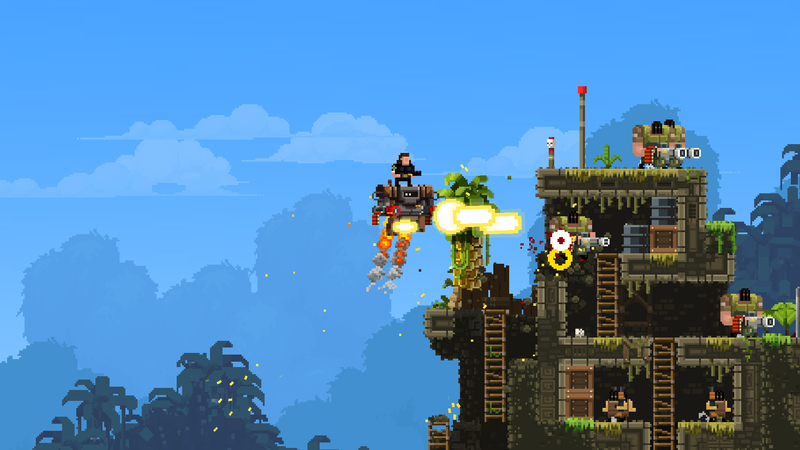 Writing up a formal review for Broforce might seem like penning a new opinion piece about The Dark Knight. After all, doesn’t it seem like the pixelated, testosterone-laden explosion-fest has been in Early Access for what feels like half a century at this point? Broforce is a game that, even in its infancy, seemed to pop up at every convention and just about every Steam sale. 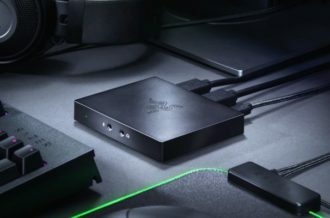 Granted, this is a title that has only been in Early Access for eighteen months, but as one of the flagship titles in the group of in-development PC games that treats this system with respect, it’s about time we get to see the final product on display. 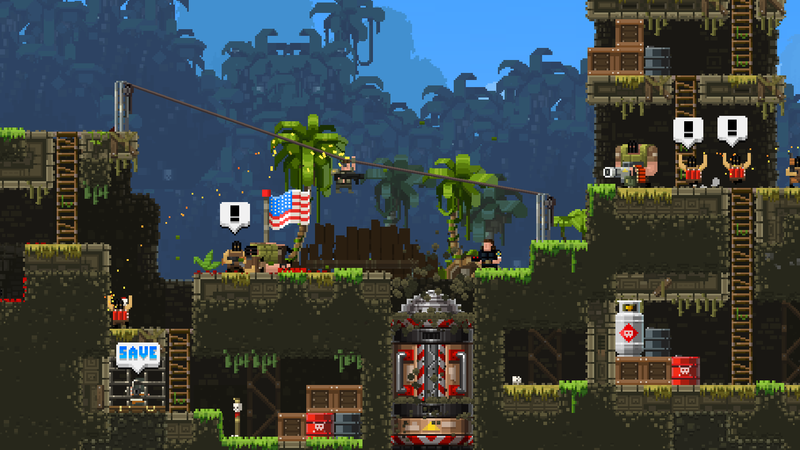 While certain aspects of Broforce‘s final build might seem like it hasn’t changed from the solid, but sometimes stubborn, Early Access builds, it’s become a title that developer Free Lives can feel proud of. This isn’t the best platformer of all time and its user interface is going to need some cleanup before it’s eventually released on PlayStation 4 sometime in the near future, but the hilarity that it brings to the table cannot be ignored. It’s pretty difficult to explain Broforce without garnering awkward chuckles or stares of bafflement, but it’s always fun to give nonsense a shot, right? 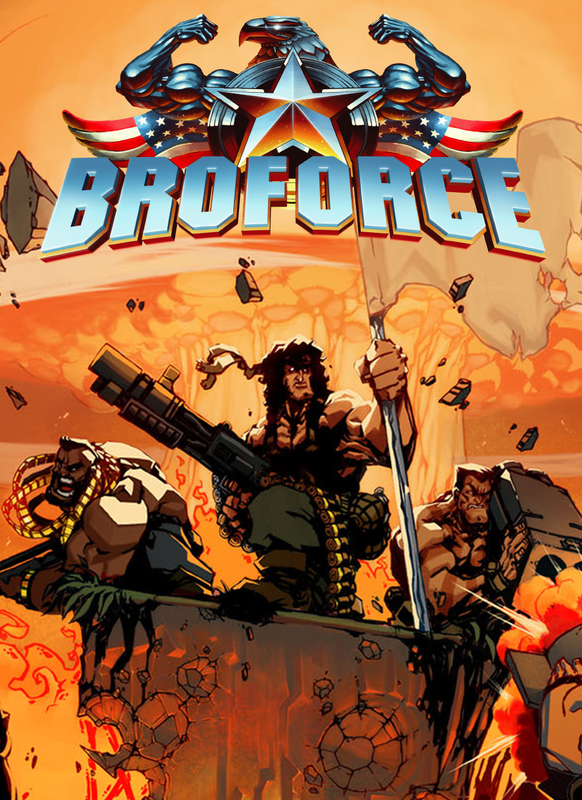 Essentially a love letter to 1980s and 1990s action movies, Broforce puts players in the role of a revolving cast of bros, each with a unique weapon, ability and borderline copyright-infringing bro-pun-filled action movie character. Every time you die or collect an extra life (by saving one of your bros from the force, of course), you switch to another bro automatically, requiring you to stay on your game at all times. The name of the game is to make it to the end of whichever stage you’re playing in by any means necessary, which is certainly standard procedure for any 2D platformer. However, all of this comes with one major twist: everything is destructible and everything on the screen is basically trying to blow stuff up. 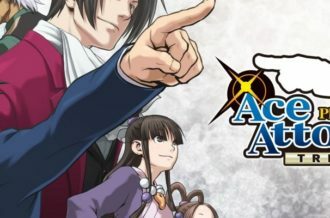 Yes, there are going to be times where the sheer multitude of explosions present will prevent 99% of players from knowing exactly what’s going on, but the lunacy for the sake of lunacy is going to more than make up for any confusion. Let’s get this out of the way before diving into anything else: Broforce‘s mechanics are not perfect, and there are going to be some annoying moments along the way. There’s always something off about platforming physics that hover somewhere between floaty and tight, and while this isn’t anything short of a sound platformer, precision isn’t really the name of the game here. For the most part, it doesn’t matter that Broforce‘s bros seem to occasionally feel like they’re on ice, but every now and then, you’ll find that landing on loan blocks can be an exercise in frustration. Thankfully this concern doesn’t rear its ugly head too often, and the fact that you can blow up essentially every square on the screen allows for some creative problem solving, but this can change once you make it to Hell (which was recently added for release). Trying to land on individual bodies that are covering up deadly spikes highlights some of these awkward physics moments, and once you notice this awkwardness, it’s hard not to notice it in the future. There absolutely shouldn’t be anything to fret over though, as players will be able to climb up any wall and use their momentum and quickness to overcome challenges that would normally require pixel-perfect timing. Oh, and it’s worth mentioning this once more (you know, because America and all): you can blow up all of the things. Just because a game isn’t mechanically perfect doesn’t mean it isn’t a whole bunch of fun. Sure, having an instant restart a la Hotline Miami, rather than a five to seven second delay between attempts on a powerful rig, would make the constant dismemberment a bit smoother, but bringing in a friend or three and shooting a bunch of garbage is an absolute blast. Whether you’re blasting through an Arcade Campaign or choosing your own path in the standard Campaign mode, you’re probably going to have a smile on your face more than not (especially as you start fighting aliens and demons in later stages). Free Lives has found a way to balance the tense gameplay that results from one-hit deaths with the bliss that comes from causing a million explosions, allowing players to manage risk in the midst of pure chaos. Add the core gameplay loop, which works well with one, two, three or four players, to the satisfaction that comes from unlocking more bros by rescuing bros, and it’s clear that Free Lives and Devolver have something here. 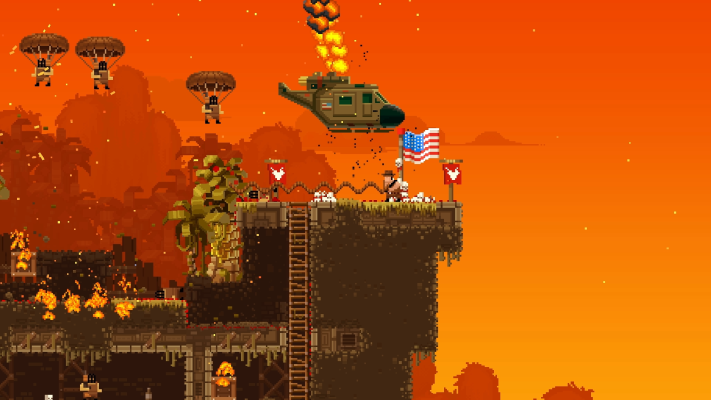 Broforce‘s two greatest strengths, which outweigh its obvious weaknesses, are its inability to take itself seriously and the strength of its enemy variance. 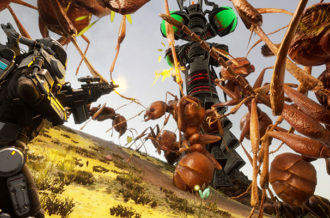 While a great deal of similar enemies are seen on the screen at once, there’s something interesting about how multiple enemies affect both the level design and the gameplay itself. 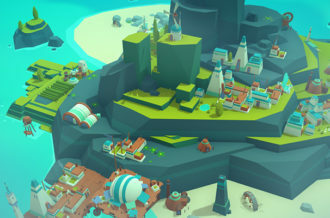 In the above image, you’ll see two enemies with dynamite strapped to their chests on the right hand side of the screen. If you were to blow them up as they stand, the entire platform will also explode, that massive thug will probably fall onto the tank below, causing it to shoot up in the air and destroy just about everything above it. This is the perfect example of both of Broforce‘s best attributes, as the ridiculous screams, explosions and sound effects that this hypothetical sequence would cause are only topped by how different this section of the stage will become. Planning out your moves ahead of time while causing utter destruction is definitely satisfying and allows Broforce to shine its brightest. Oh, and it’s only right to note that the classic 80s movie tough guy narrator’s quips make every level opening and every death feel epic. If any complaint should be leveled against Broforce at this point in time, its that certain aspects of the final build still feel like they haven’t been fixed as of this writing. Granted, there have been almost daily patches leading up to launch, so any sentence here could instantly become outdated immediately, but this is the world we live in at this point, and reviewers can only review what’s in front of them. Broforce‘s user interface, specifically its main menu, still feels mildly broken when you try to use a controller, especially a DualShock 4 or Xbox One controller. Xbox 360 controllers will play nice, meaning that you won’t have your menu automatically select a host of random options, only if it’s been plugged in from the moment you boot up this title. This is certainly something that will be fixed in the future, as it’s hard to imagine a game with a broken menu passing Sony’s certification process, but at launch on PC it’s hard to ignore. One final point: finding an online match has always been a bit of a tall task at times, and one has to wonder if the amount of players who have already gotten their Broforce fill in Early Access and left will come back to populate the pool of available online co-op participants. If you’re going to pick up an independent game to cleanse your palette before the torrent of massive Fall releases begins, you could do a lot worse than Broforce. Yes, a great deal of the players who would have been interested in Broforce have gotten their fill in the past eighteen months and moved on, but those who have waited for the end of the PC development cycle will be rewarded with a whole mess of fun. There’s something primal about being a dumb dude blowing up other dumb dudes in a dumb game and Free Lives has found a way to tap directly into that. 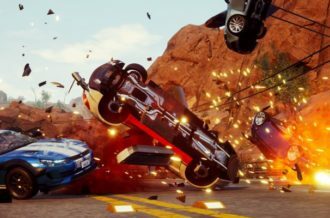 While the mechanics are not as tight as they could be, and there still is a bit of rust hanging around from Early Access, this that shows us that giving an in-development title your hard-earned cash isn’t always a bad call. Perhaps with future content updates and tweaking, Free Lives can elevate Broforce from the good game it is to the great game it can be.